If you’ve ever played Kirby’s Epic Yarn, then you know what to expect from Yoshi’s Woolly World, which feels a lot like its sequel. Both titles feature simple platforming, loads of collectibles, and a signature yarn-based art style, but Yoshi’s Woolly World sets itself apart by more fully taking advantage of the concept’s potential. At its best, Yoshi’s Woolly World combines its appealing aesthetic with (sometimes) great level design, and creates something really special, but most of the time it falls short in accomplishing the latter, and ends up being an unchallenging platformer. Yoshi’s Woolly World’s biggest draw is its distinct, vibrant presentation. Everything in Yoshi’s Woolly World looks like it came straight out of an arts and crafts project, and has enduring charm that affects gameplay in interesting ways. Threads can be pulled to unravel a patch of yarn and lead to a hidden area, and Yoshi’s feet become propellers when she jumps. The soundtrack is equally impressive, which features catchy tunes that match the various hand-knitted environments the player visits. While the presentation of Yoshi’s Woolly World is always spot-on, the level design is a little less consistent. Some stages have dynamics that complement the yarn gimmick of the title, like one stage where Yoshi must roll a giant ball of yarn to help unravel otherwise unsolvable puzzles. There are also several segments where Yoshi is transformed into a mole creature, or an umbrella, which are really awesome, but sadly are far too brief and infrequent. Instances like these show the potential that Yoshi’s Woolly World has as a unique platformer, but this isn’t always taken advantage of. In fact, most levels play out like any other platformer, and almost completely disregard the primary advantage afforded to the title–a very enticing wool-based premise. Perhaps more disappointing than the often lackluster level design, is the consistently uninteresting boss fights. The boss fights in Yoshi’s Woolly World are not only dull, but extremely easy to overcome, and don’t take advantage of any fabric-based gimmicks. It’s especially bothersome when you’ve played through a bunch of levels and built anticipation for a climactic finale that fails to deliver. This is one of Yoshi’s Woolly World’s biggest failings, and the whole boss fight element feels very tacked-on. Yoshi’s Woolly World is not a challenging platformer, and that may be by design, but for me, it mostly made the experience a little tedious. Hopping from platform-to-platform is a breeze with Yoshi’s unfairly overpowered jump, and the difficulty level peaks after the first few stages. An alternate difficulty mode called “Mellow Mode” makes an already easy game even easier by giving Yoshi winds, so that they can complete the game with as little effort as possible — I do not recommend this mode to any person, even small children. The best way to play Yoshi’s Woolly World is with a friend. Players can work together, for example by swallowing one another and using their friend as egg ammo, is a lot of fun, and most levels in Yoshi’s Woolly World feel like they were designed for co-operative play. Like most platformers, though, the issue of two players fighting over screen space, and dragging their partner offscreen and to their death still plagues Yoshi’s Woolly World. This is a minor gripe, though, as co-operative play provides a huge improvement to the title, which I can’t say for most platformers. 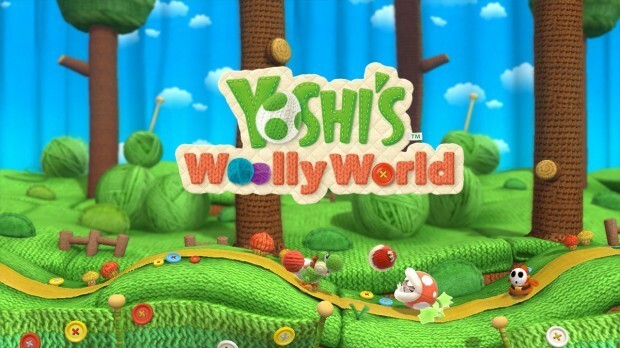 Collectibles are a huge part of Yoshi’s Woolly World, and consist of yarn, daisies, stamps, and beads. Yarn unlocks new skins for your Yoshi, and becomes instantly addicting to collect, and collecting enough daisies unlock stages that are often some of the most inspired levels in the game. While these two collectibles both present very real incentives to explore each level, stamps and beads are much less appealing. Stamps unlock Miiverse content and beads allow the player to buy power-ups that can be acquired at the beginning of each level, but aren’t at all necessary, since Yoshi’s Woolly World is already a fairly unchallenging platformer. Yoshi's Woolly World is a charming, yet unchallenging platformer that succeeds at being an amusing way to pass the time.